I was surprised and curious when I heard about Pride and Prejudice and Zombies, but I wasn't curious enough to deal with the grotesque additions to Austen's beloved story. So when a friend recommended a fantasy retelling of Pride and Prejudice because the author's style was similar to mine (meaning we were both influenced by Austen) and it had dragons, I decided to read it. I'm glad I did. Elle Katharine White's Heartstone passes the test for this picky Jane Austen fan and is a good story in its own right. The Island of Arle is home to many creatures. Some creatures are friendly to humans. Some are not, and between these monsters--gryphons, banshees, lamias, and more--and humans stand the Riders, an elite class of warriors, proud and deadly. They are aided by the tougher of the friendly creatures--dragons, wyvern, and beoryns. Alistair Daired, dragon rider, belongs to this group of warriors. You've probably already guessed that this is the Darcy character and that Elizabeth Bennett's character, Aliza Betaine, is not from among the Riders. Aliza meets Daired, and Brynsey and Charis (Bingly and sister), when they are hired to rid her area of gryphons after a gryphon kills her sister (Kitty's character). Unfortunately, the battles to keep the Tekari (the unfriendly creatures) at bay ultimately becomes a war for the entire land of Arle when the Greater Lindworm is awakened. White's story world is intriguing with its blend of adorable garden hobgoblins, fearsome lamias, friendly dragons, and powerful forgewights (I really liked these), as well as an interesting culture that is in some ways similar to Austen's and in some ways utterly White's own. The title refers to the stone each Tekari has in its heart. These stones, jewels, are used as engagement stones. Kinda creepy, but it fits the warrior culture. There is violence and death and sorrow, but it is not too much and is not graphic. Not only did I like the world White set the story in, I also like how she blended Austen's story into that world. Austen's characters were easy to spot with cleverly similar names. For a fun addition, Mr. Collins's character's first name was Wynce. Wynce Curdred. She also softened some of the characters, redeeming even Mr. Collins's character in a way fitting to Austen (Aliza realizes she misjudged Collins, that despite his flaws, he's a kind, wise magistrate). However, Wickham's character is suitably corrupt, but there is never much of a connection between him and Aliza, as there is in Austen's story. Aliza is likable and brave. She's surprisingly prone to eavesdropping, not a typical trait of an Austen heroine. She's also a healer, a skill I always reading about. To my great satisfaction, Daired is more than the handsome, rich, madly-in-love hero some reduce him to. White purposely portrays him as a man of good character who changes when he recognizes his faults--a true Darcy. 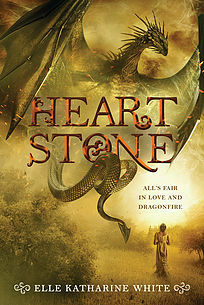 In conclusion, if you like fantasy with a cool world (and dragons), if you like Pride and Prejudice, then you should add Elle Katharine White's Heartstone to your reading list--somewhere near the top of it. Also, White has a sample chapter and several story extras on her website, including character profiles and a few pages of Mari's bestiary with illustrations of some of the story's monsters, if you'd like a sneak peak. Have you read any Pride and Prejudice retellings that you'd recommend? Or do you have any favorite magical creatures?